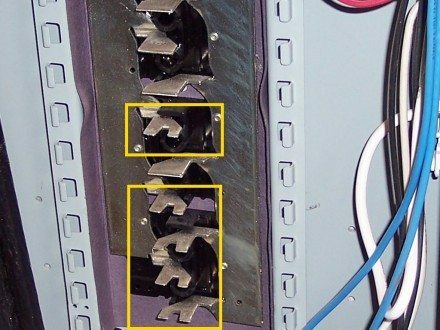 Confusion abounds over the use of tandem circuit breakers in panelboards, even among electricians and electrical inspectors. 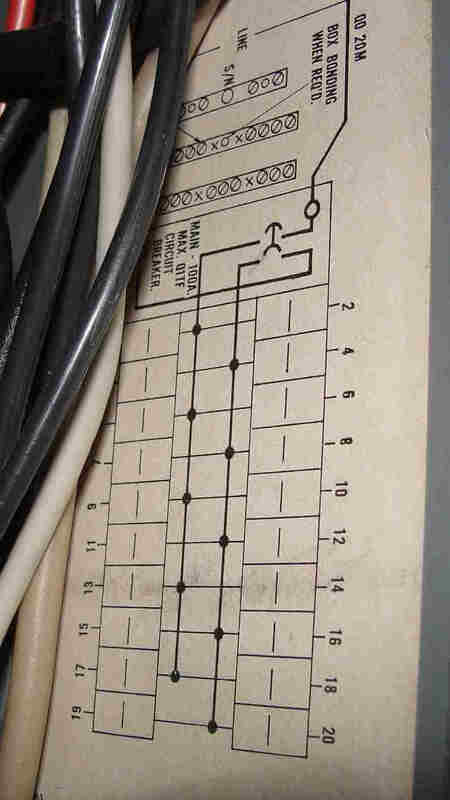 Today I'll set the record straight as to when tandem circuit breakers can be used. This is an adaptation of an article I wrote for the ASHI Reporter, which was published in February of 2011. First, a quick definition. A tandem circuit breaker is a double circuit breaker that takes up the space of a single circuit breaker on a panelboard. You'll also hear them called duplex, slimline, twin, half-height, half-inch, double and wafer breakers, depending on local customs. 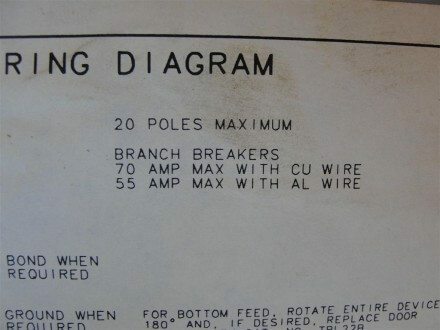 While a two-pole circuit breaker gets connected to two different poles at a panelboard and has a common trip or a handle tie for simultaneous disconnecting of two poles, a tandem breaker does not. 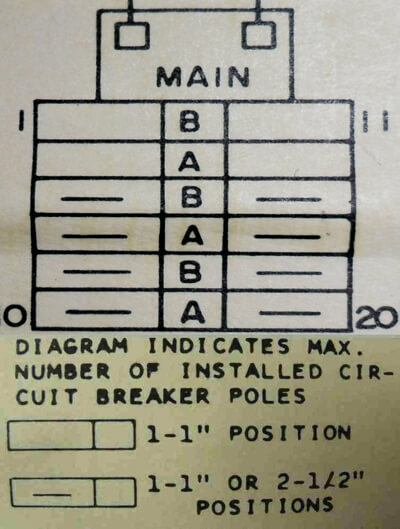 The photo below shows a 60 amp two-pole circuit breaker at the top, then a 15 amp tandem circuit breaker (highlighted), then a 20 amp tandem circuit breaker (highlighted), then a 20 amp single-pole circuit breaker at the bottom. The next photo shows an older style tandem breaker found in Square D panelboards. Because tandem circuit breakers allow for two circuits to be installed on a panelboard in a one circuit breaker space, they're typically used after a panelboard has been filled to capacity with standard circuit breakers. Because of this, they're often referred to as "cheaters." Is this really 'cheating'? No, it's not. The use of tandem circuit breakers is a perfectly acceptable practice, as long as the panelboard is designed for tandem circuit breakers and they're installed in locations within the panelboard where they're allowed. 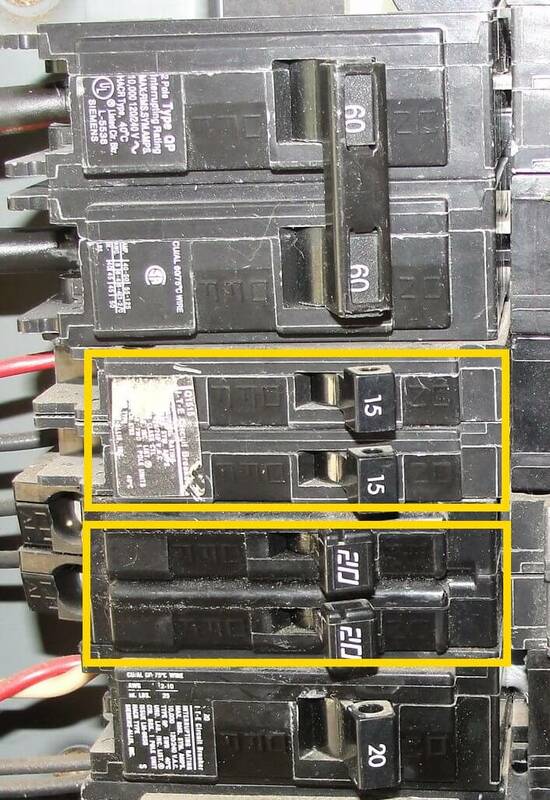 How does a home inspector determine whether tandem circuit breakers are allowed on the panelboard they're inspecting? There are a number of ways to do so. Based on this formula, the maximum number of circuits allowed in a 100-amp 120/240-volt panelboard is 20. For panelboards not manufactured as "lighting & appliance" panelboards, there is no limit to the number of circuit breakers allowed. This formula is also no longer applicable for today's panels. Manufacturers still list the maximum number of circuit breakers allowed, and must provide a rejection feature to help prevent the use of tandem circuit breakers where not allowed. Class CTL panelboards have different methods of preventing class CTL tandem circuit breakers from being used in locations where they’re not allowed. This is referred to as a “rejection feature”. 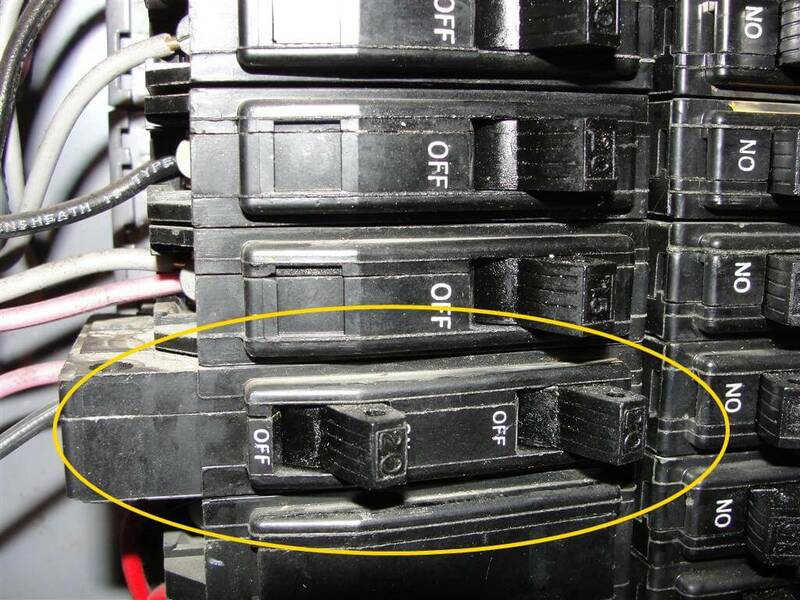 In the photo below, the highlighted bus stabs are notched to allow the use of tandem circuit breakers; the bus stabs which don’t have this notch won’t allow tandem breakers. Class CTL tandem circuit breakers have a different shape than standard single pole circuit breakers, to help prevent them from being installed where they don’t belong. 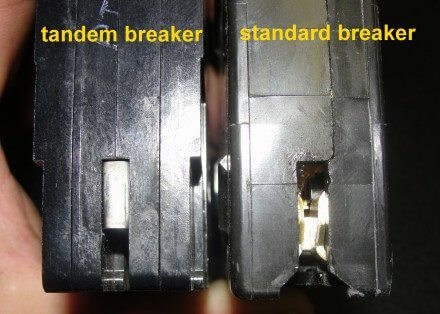 Tandem circuit breakers are manufactured this way in an effort to prevent people from using them in an improper manner – but this doesn’t stop everyone. 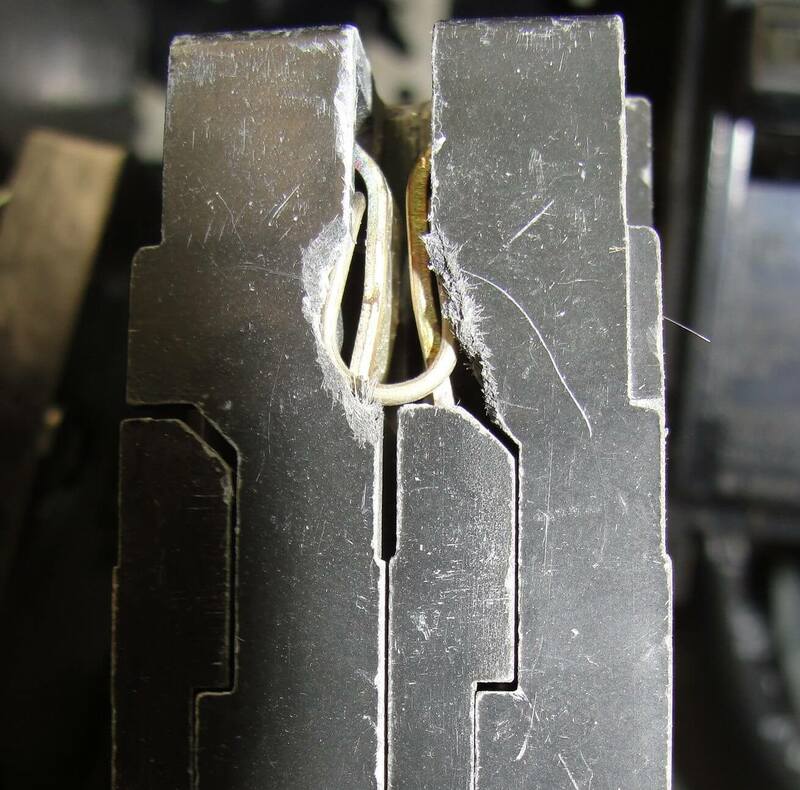 In the photos below, you can see how someone broke the bottoms of the circuit breakers to make them fit where they didn’t belong. This is probably where the term "cheater" comes from. For panelboards manufactured before adoption of the Class CTL standard, non-Class CTL tandem circuit breakers are allowed to be installed as replacement circuit breakers only. 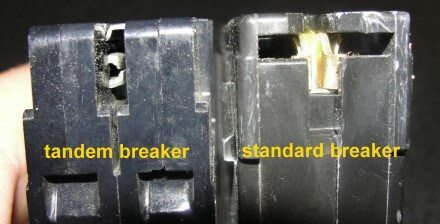 Non-Class CTL tandem circuit breakers do not have the ‘rejection’ feature that Class CTL breakers have. 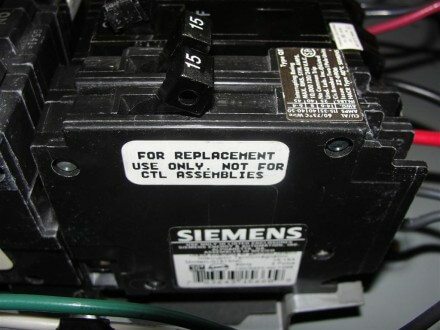 As clearly indicated by the label on the side of the circuit breaker pictured below, these circuit breakers are not allowed in ClassCTLpanelboards. The difficulty for home inspectors is that the marking is not usually visible after installation, and home inspectors aren't supposed to pull out circuit breakers to try to figure this stuff out. Does the panelboard allow tandems? 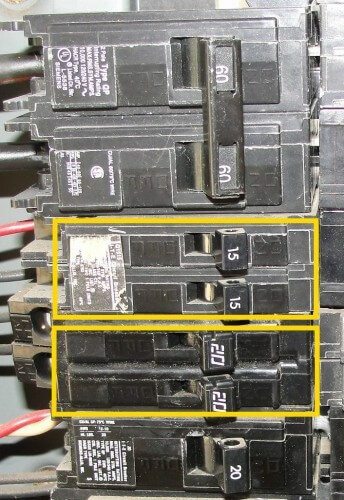 Now that I’ve talked about the general rules for tandem circuit breakers, I’ll discuss the ways that home inspectors or electrical inspectors can determine when tandem circuit breakers are allowed in various panelboards. G3040BL1200 = 30 spaces, 40 total circuits allowed. Up to 10 tandem circuit breakers can be used. G3030BL1150 = 30 spaces, 30 total circuits allowed. Tandem circuit breakers are not allowed. BR1220B100 = 12 spaces, 20 total circuits allowed. Up to 8 tandem circuit breakers can be used. 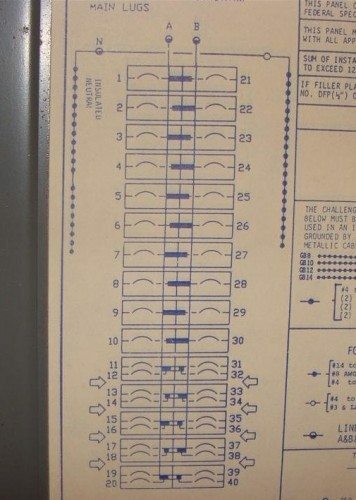 BR1212B100 = 12 spaces, 12 total circuits allowed. 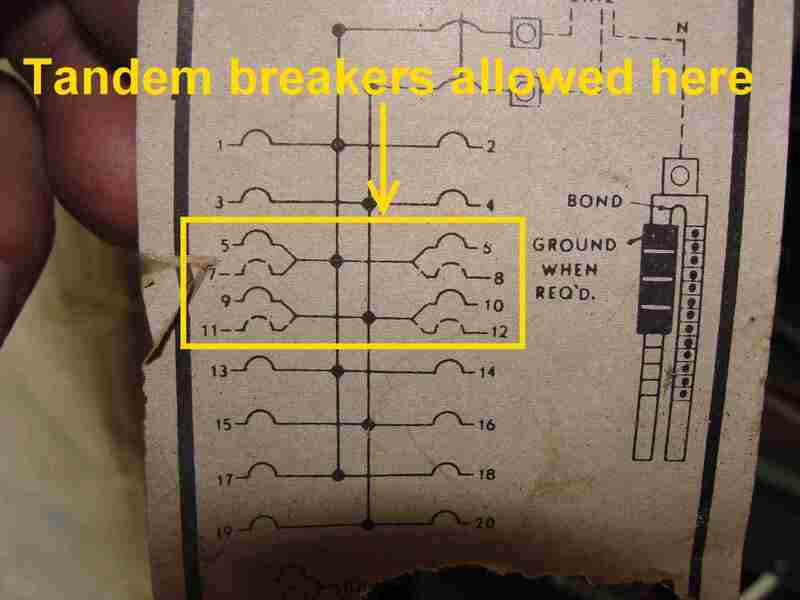 Tandem circuit breakers are not allowed. HOMC20U100C = 20 spaces, 20 total circuits allowed. 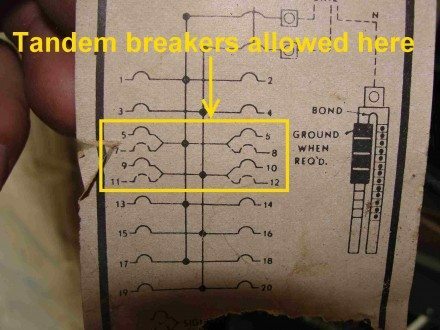 Tandem circuit breakers are not allowed. I think it's easy enough to see the pattern. 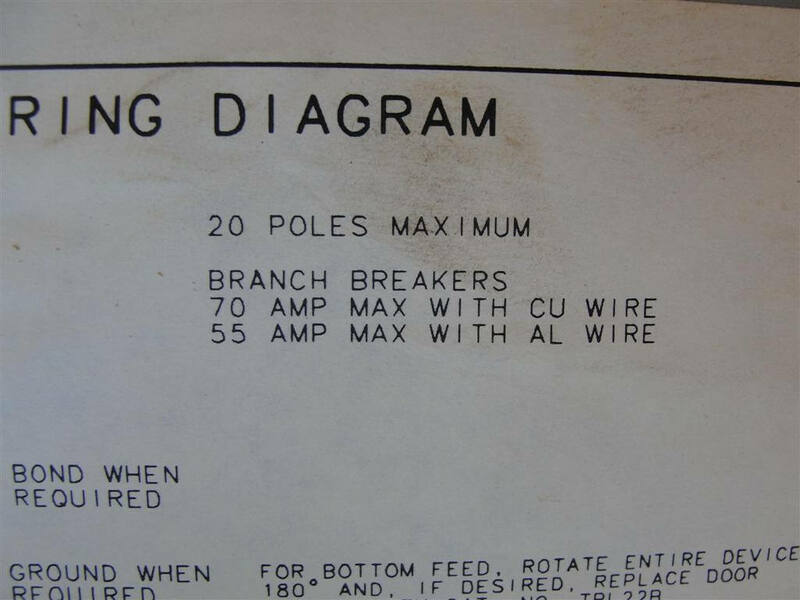 The wiring diagram inside the panelboard is a great way to determine if tandem breakers are allowed and, if so, exactly where they're allowed. In the photo below, you can see that the top four spaces allow only full size breakers, while the bottom eight slots allow tandem breakers. Here’s another panelboard diagram – this panelboard allows the use of tandem breakers in four locations. And another – this panelboard doesn’t allow any tandem breakers. And another – this panelboard allows tandem breakers in the bottom ten spaces only (11-20 and 31-40). Another easy thing to look for is a label stating the maximum number of circuits allowed. 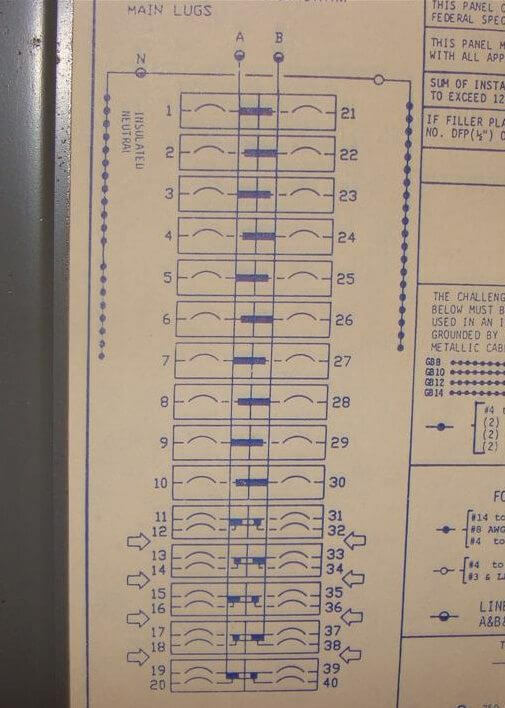 In the photo below, you can see that only 20 circuits are allowed at the panelboard. This panelboard has 20 full-size spaces, so tandem circuit breakers aren’t allowed. What's the concern with tandem circuit breakers? When tandem circuit breakers are used in locations where they're not allowed, they could make an improper physical connection to the bus bar in the panelboard, which can create a fire hazard. 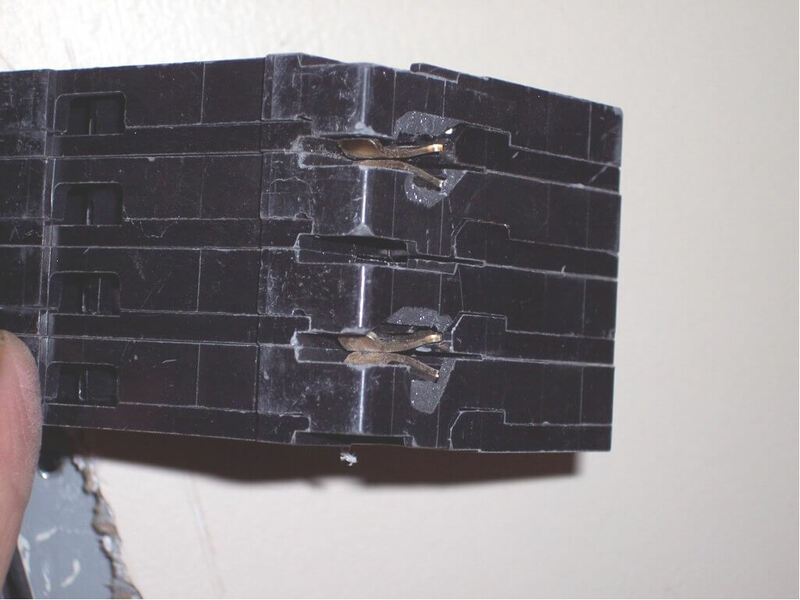 Tandem circuit breakers also increase the total load on the bus bars in a panelboard; this is where home inspectors need to use common sense. When a home inspector finds tandem circuit breakers used in improper locations, they'll often recommend repair by an electrician. If the bus bars of the panelboard have been damaged or altered to allow for the installation of tandem circuit breakers, the proper repair is to have the panelboard replaced. 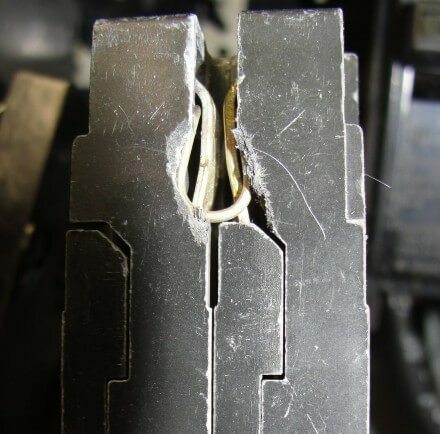 There is no way for a home inspector to determine if the bus bars have been damaged without actually removing the circuit breakers, which is something home inspectors shouldn't be doing. Information for this article was provided, in part, by Alan Manche of Schneider Electric, Stephen Ploszay of Siemens Industry, Inc. and Joseph Fello of Eaton Corporation. Also, a special thanks to Retired ASHI Member Douglas Hansen.